On May 16, 2017, BTH had the pleasure of hosting the first ever Techtank Expo, where students, teachers and researchers got the chance to explore collaboration opportunities with representatives from Techtank member companies. 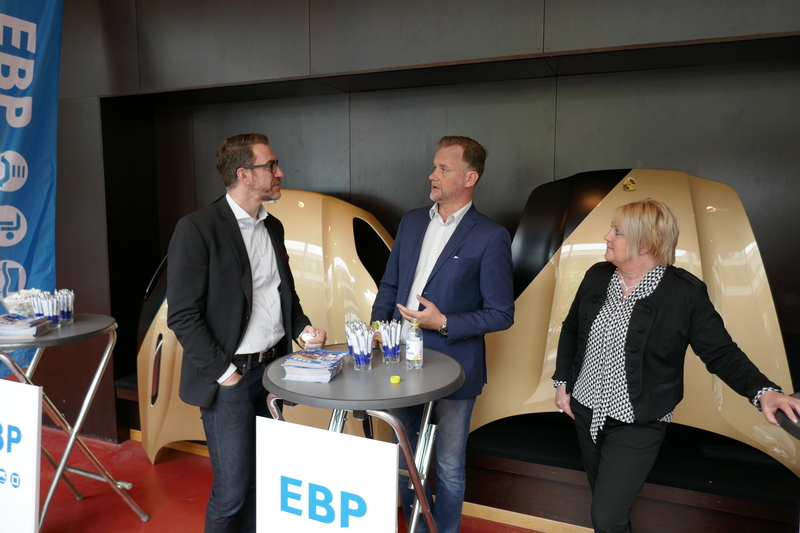 Henric Johnson from BTH talking to Ronnie Rossander and Anette Kjellsson from EBP. Techtank Advanced Engineering Alliance is a technology cluster in southern Sweden (with the cluster organization based in Olofström) which gathers advanced industrial and technology companies. At BTH, we are working closely with Techtank and its members to find opportunities for collaboration in both education and research activities. We co-designed the Techtank Expo to serve as a tangible contact point between BTH and Techtank, spreading the word about what Techtank and its member companies do and need, while also exposing them to the capabilities of students, teachers and researchers at our university. Each of the participating companies presented briefly about their company profiles, activities, products and challenges moving forward, and the very interesting presentation part was followed by a lunch expo where participants got a chance to talk more in-depth with each other while also taking a closer look at some of the products being showcased. For instance, EBP (European Body Panels) had brought bonnets from both a Porsche and an Aston Martin, which attracted a lot of attention from participants. Volvo Cars brought a brand new S90 and an equally fresh V90, and Semcon showcased a concept for a cable tensioner for NKT Cables (the creators are three thesis workers from BTH, by the way). Other companies present at the Techtank Expo were Projektengagemang, Binar, Evomatic and Tre D Mekaniska. Several other Techtank member companies that couldn’t make it to the Expo were on display via rollups and other information material. During lunch, the companies also did a brief walkthrough of BTH Innovation Labs, our new and improved prototyping facilities, including the BTH Makerspace, to show how we at BTH are investing in and democratizing “making” capabilities and labs. In the afternoon, our both Deans, Claes Wohlin (Faculty of Computing) and Tobias Larsson (Faculty of Engineering) gave the participants insight into our different departments and research topics. All in all, a very interesting day that hopefully opens the door to many future collaboration projects between BTH and Techtank member companies. Thank you to everyone involved during the day, with a special thanks to Ingela and Karin from Techtank for making this possible. If you are interested in how your company or organization can collaborate with BTH, please reach out to Andreas Larsson.